Mr Shuck was nice enough to call me at work today to inquire about my cupcake needs while he was in the immediate Yellow Leaf area. I called the store and discovered that a new flavor (Cinnamon) was being debuted today. I sent speedy text back to my beloved indicating my chosen flavor and he stopped by to obtain one for me. The baker at Yellow Leaf hadn’t even gotten the Cinnamon Cupcakes out of the kitchen, so I ended up with the first one purchased. Michael of Yellow Leaf informed Mr Shuck that the Cinnamon was similar to their French Toast, so Mr Shuck thought I would be pleased. 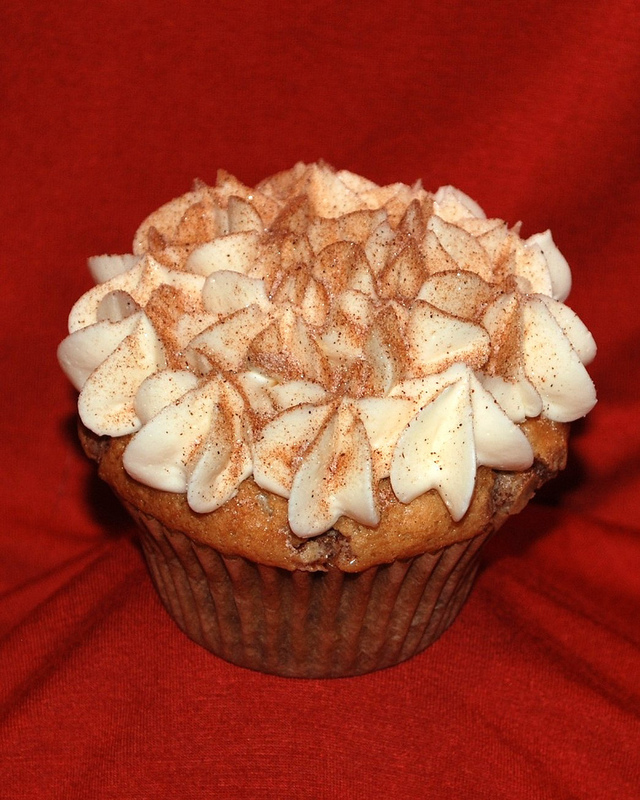 The details: Vanilla cake with lots of cinnamon chips topped with vanilla Italian butter cream sprinkled with cinnamon. The verdict: YUM! You can’t go wrong with Yellow Leaf’s vanilla cake. The cinnamon chips are probably my favorite ingredient in the French toast cupcake and there are more in the new version. The cinnamon sprinkled on top of the icing greatly improved the texture and flavor.